While I spent my vacation in the relative warmth of India, the igloofication of my beat-up old Chevy proceeded apace in Cambridge, fueled by snowstorm after snowstorm, and an icy wind or two. On Friday night, more than three weeks later, I finally mustered enough motivation to rescue the poor thing from under all the ice and see if the old battery still had any life left in it – 4 inches of soft snow all over the car followed by a solid inch-thick sheet of ice. 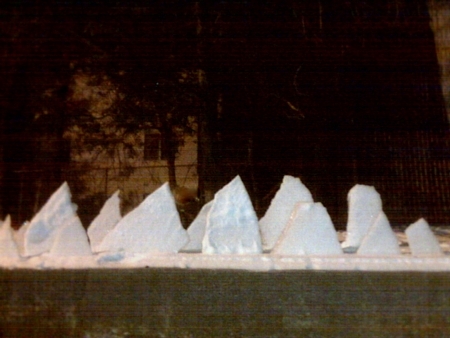 Curiously, below this ice sheet was another layer of soft snow that could be pried out with a small ice-scraper, whereupon entire sheets of ice could be lifted from the frozen car and improvised into a flat-backed polar Stegosaurus on the cement wall. I’ve had my computer learn how to spell iglooification so it doesn’t get underlined in red. You’ve invented a new word that I can’t imagine how I lived without. Thanks.